Did we learn anything from the Nestle Family Twitter-storm? Remember my post from a couple years ago about the Nestle boycott*, the boycott that has been going on since the ’70s? Well, today the boycott and all of Nestle’s alleged crimes against humanity were brought to the forefront due to the #NestleFamily blogger event and the power of social media. As the event got underway today, the tweets began to fly on Twitter. While many civilly debated the issues at hand (unethical marketing of formula to developing countries where there isn’t access to clean water, child slave labor in the chocolate industry, the bottled water), others (from both sides of the debate) turned to name calling and snark. Still others tried to turn it into a debate of breastfeeding vs. formula feeding, ignoring the real issue at hand – Nestle’s unethical business practices. The bloggers who choose to attend the #NestleFamily event were caught in the middle. Some relayed the concerns and questions from the Twitterverse to Nestle, while others Tweeted about which Nestle candy they liked best. The chatter on Twitter went on for hours before @NestleFamily (who had no social media team) finally stepped in and tried to field some of the questions themselves instead of depending on the #NestleFamily event attendees to do it for them. It was reminiscent of the #MotrinMoms debacle except Motrin responded with apologies and corrected their infraction. I have my doubts that a conversation with a bunch of bloggers at this point in time is going to bring about any real changes with with a company like Nestle that has been conducting business unscrupulously for more than 30 years. I’d love to see them prove me wrong though. To me this is a case study for poor planning, short-sighted thinking and other classic marketing errors. What is clear to me is that there was no strategic or top-level thinking applied to this horrific play for Moms on the part of Nestle. This is a stunning example of why those who are involved with marketing to women and in specific, social media need to have well grounded leader managing their strategy. Nestle has lost control of the conversation – in fact the conversation that is being had is not only off-message (one would assume) but the defense of Nestle has been left in the hands of those least qualified to handle it — the bloggers who answered their call and came for a few days of fun. This is damaging to the brand on a profound level (obviously) and leaves these bloggers in an untenable position. Feeling loyal, under attack, not knowing facts, frankly over their heads and outside of any normal scope of engagement for an event like this. I think there is an opportunity for Nestle, as a leader in the food industry, to take a leadership role on this issue. At a minimum it should start abiding by the law in all countries where it operates and not just the letter of the law, but the spirit of the law. But ideally, in order to rectify some of the damage that its past practices have caused, it should go above and beyond what the law requires. Christine at Pop discourse wrote On Bloggers, Breastfeeding, Formula, Morality, Change, & the Nestle Family Event and talks about why she chose not to attend the #NestleFamily event and how all of this impacts blogger relations in general. MommyMelee wrote a great post called thinking outside the hashtag about ways you can take action. I encourage people who are upset to research ways they can help, whether it’s through positive activism and awareness, donating time, or donating money. If you’ve written about this Nestle event, please leave me your link in the comments. I hope to put a list together. Thanks! In the meantime, please check out this Anthology of #NestleFamily Activist Blogs put together by @BestforBabes. 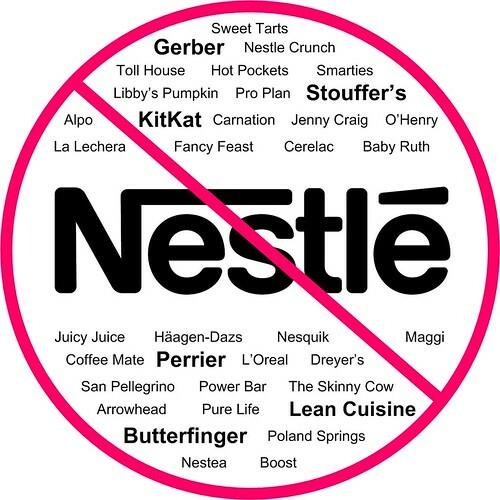 *Please note: there is now an updated Nestle boycott list as of 10/7/09. Thanks! Posted on September 30, 2009 Author Categories Activism, Breastfeeding, Current Events, Environmentalism, Health, Kids, Maternal HealthTags action, Activism, africa, boycott, Breastfeeding, breastmilk, clean water, developing nations, formula, nestle, nestlefamily blogger event, social media, third world countries, unsafe, water, WHO60 Comments on Did we learn anything from the Nestle Family Twitter-storm? Another reason to steer clear of high fructose corn syrup – mercury! Janelle Sorensen (of Healthy Child, Healthy World) co-authored the studies for the Institute for Agriculture and Trade report along with Dr. David Wallinga, mentioned in the Washington Post article. According to Sorensen (who spoke with me via email), at this time it is unknown what species of mercury this is. Personally I don’t know that it matters too much, because mercury is just plain bad for our health. The EPA has determined that mercuric chloride and methylmercury are possible human carcinogens. Very young children are more sensitive to mercury than adults. You may recall that the Environmental Protection Agency has issued warnings regarding the consumption of certain types of fish containing mercury for women who are pregnant or may become pregnant, nursing mothers, and young children. That’s why the HFCS commercials by the Corn Refiners Association are so laughable. They say HFCS is fine in moderation (though they never quantify what that amount is), but how do you consume it in moderation when it’s infiltrated a large percentage of the products in the grocery store? What really freaks me out though is to know that corn syrup is in infant formula. It might not be high fructose corn syrup, but still. Does a baby need artificial sweeteners? What about genetically modified (GMO corn) sweeteners as most corn is? And more importantly, how can a baby, who’s diet consists solely of formula, possibly consume it in moderation? Or is moderation only necessary for HFCS, but not corn syrup? I tried to find the ingredients in formula listed online and was able to find a few brands – two listed the first ingredient as water, followed by corn syrup. That’s alarming to me. Could this prevalence of corn in the diets of the youngest of our species, as well as being the number one thing Americans eat (because it’s in nearly everything), be contributing to the rise in corn allergies in this country? My guess is yes. In essence, we rely on a vastly complicated global food system that has many opportunities to go awry. And, not only is the chain of ingredients and manufacturing very complex, the foods we are eating are very complex and unlike anything people ate even two generations ago. HFCS is one story in this grand theater of food production. And, even though the studies are small, it’s clearly an actor that deserves more attention as a potential instigator in the public health drama we are currently witnessing. First of all, HFCS is an unnecessary part of the human diet. We thrived for millennia without it. Second, the caustic soda used to manufacture it can be made using mercury-free technologies. Safer alternatives exist and are used widely at this very moment. Third, even though the exposure is minute, it’s a repeat offender in the average US diet and should also be addressed in the context of combined daily exposures of modern day society. The authors of both of the studies recognize the limitations of their findings. There is clearly much more research to be done in order to be able to understand what the true health implications may be. Maybe the impacts end up being nominal, but who wants to risk their child’s health and development waiting to find out when it’s such an unnecessary exposure? Human development is a miracle. The journey from egg and sperm to adult (and even beyond) is a tumultuous and risky endeavor. Research is increasingly showing how very vulnerable the developing fetus is – susceptible to exquisitely small environmental exposures – so, why take an unnecessary chance? Why even allow antiquated technologies that are extremely pollutive; that have safer, economically feasible alternatives; that are completely unnecessary in food production? There is not a single piece of this story that makes sense. The FDA and industry are quickly trying to assuage the concerns spread by these reports, calling us irresponsible for setting false alarms. But, the FDA and industry are notorious at this point for coercing people into taking risks their instincts tell them not to. I’m not anti-FDA nor anti-industry; I simply believe in transparency of information. If you decide this risk is nominal, that’s your decision. For me, and my family, it’s not okay. And, it’s extremely simple to avoid. How do you avoid HFCS? You buy whole foods, not processed foods. You prepare meals from scratch. You grow your own vegetables and buy from local farmers’ markets, farm stands and CSAs. You look for certified organic foods. You read the labels and find alternatives to the products containing HFCS. It might seem like it’s in everything, but it’s not. There are brands of bread that don’t contain it (even at Costco), just as there are brands of soda, yogurt, and infant formula, but you have to read the labels to find out. Become a wise consumer and vote with your dollars. It might seem like the best bet it to avoid HFCS at all costs, but even Sorensen admits that she lets her kids consume it once every now and then. “It’s a very small amount and I know I’m very careful about other exposures. Life is all about balance.” Yes, yes it is. Lastly, if you are looking to reduce the HFCS in your or your family’s life, you might want to check out the blog A Life Less Sweet – One family, no high fructose corn syrup, eating healthier. And here are a few more related posts: from Nature’s Child – HFCS, fortified with mercury, from Ask Moxie – Whoa: Mercury in HFCS, and (a really good one) from AngieMedia – High Fructose Corn Syrup is Dangerous for Many Reasons. A couple more: from Mom-101 – High fructose corn syrup contains mercury and other reasons I think we’re going to start feeding our kids air and from Her Bad Mother – Poison In The Ketchup: This HFCS Scare Might Actually Make Me Start, You Know, Cooking From Scratch Or Something. Posted on January 29, 2009 Author amygeekgrlCategories Activism, Environmentalism, Food, Health, Kids, Maternal Health, Mothering, Natural LivingTags allergies, babies, children, Corn Refiners Association, Dr. David Wallinga, EPA, FDA, formula, Health, HFCS, high fructose corn syrup, infant formula, Institute for Agriculture and Trade, Janelle Sorensen, mercury, Washington Post41 Comments on Another reason to steer clear of high fructose corn syrup – mercury!